Shish Taouk kabab which is also written in other spellings like shish twook kebab etc., this is Arabic most famous tikka dish and quite famous in Lebanon, Turkey, Middle East etc. this is just like Pakistani Tikka but quite different in taste and very delicious. 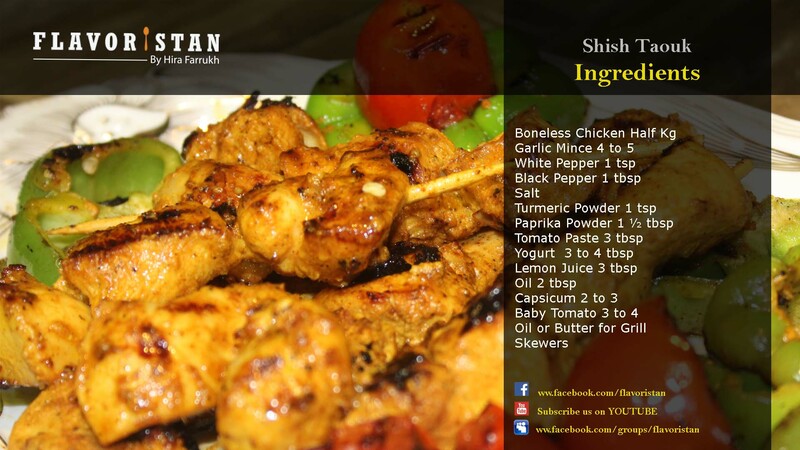 you must try this shish taouk kobob cuisine recipe. I have tried my best to describe each and every step of this cooking recipe so you must enjoy the taste of arabic chicken tikka food recipe at home. For more cooking videos subscribe our youtube cooking channel and enjoy the loving food recipes by Hira Farrukh, you can also like our flavoristan facebook page and keep yourself updated for new recipes and cooking videos including our live cooking shows which telecast on our youtube channel or facebook group.